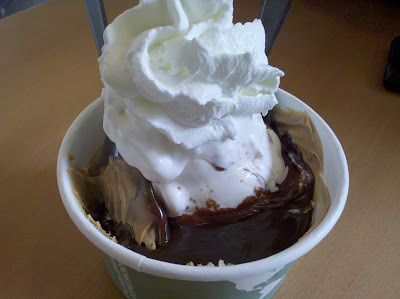 The BF and I took a walk around the 'hood one weekend, and stopped at Old School Frozen Custard on Capitol Hill. They have the creamiest, smoothest ice cream (I mean custard!) I've ever experienced. It's different from other premium ice creams. It's dense, but also soft, velvety, oh-so-smooth. They always have the two basic flavors: vanilla and chocolate. They have a third flavor that changes daily. It may not sound like a lot of choices, but it's enough. Various candies and cookies can be purchased as a topping or for "mix-ins" if the plain vanilla and chocolate doesn't do it for you. They also have several sundae and shake concoctions. This is where it's really at! The BF and I shared the Muddy Buddy sundae, which had two scoops of vanilla frozen custard, hot fudge, and a warm fudgy brownie shmeared with peanut butter. And whipped cream. It's over the top. Why have I not thought of this before? 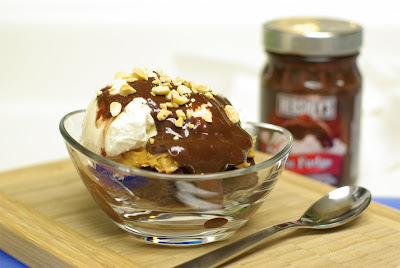 Peanut butter in an ice cream sundae is delicious! And obviously, the brownie. But it was the peanut butter that was key for me. I mean, I've had peanut butter ice cream before, which can be good, but what really did it was having a huge SLATHER of peanut butter cradling the frozen custard. So I set out to make it at home. And I did a pretty good job, if I do say so myself. I made the fudgy brownies, studded with dark chocolate chips. Once cool enough to handle, I shmeared a good load of peanut butter onto it. I opted to leave the whipped cream off (this time) and added some chopped roasted peanuts instead. I used store-bought hot fudge which worked just fine for the moment. I'll try making my own next time. For the days when I can't make it out to Old School Frozen Custard, this homemade version will suffice. But then I'll have to go out to walk off all those calories. Maybe I'll take a walk to Old School Frozen Custard.